Quality is our mission and is the essence of our products. We have adopted stringent measures to incorporate it in all our activities. Accurate quality tests are conducted at various stages on all our products to ensure that they are defect free. We also make sure that the raw material used in the production is carefully inspected at the time of procurement. We monitor our production process closely. We have also developed many different techniques and concepts to ensure that our products are of prime quality and with zero defects. 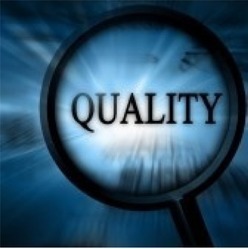 Quality is our mission and is an important essence of our products. We have always adopted stringent quality control measures and have deeply incorporated it in all our activities. Accurate quality tests are conducted at various stages of production for all our products to ensure that they are defect free and the client remains stress free. We also make sure that the raw material used in the production is carefully inspected at the time of procurement. We monitor our production process closely. We have developed many different techniques and concepts to ensure that our products are of supreme quality and with zero defects. Our exclusive range is checked on the following parameters of production as per order specification finish branding packaging consistency.